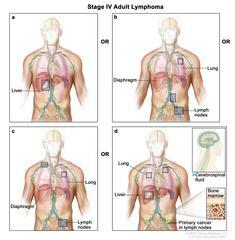 Stage IV adult non-Hodgkin lymphoma; drawing shows cancer in the liver, the left lung, and in one lymph node group below the diaphragm. The brain and pleura are also shown. One inset shows a close-up of cancer spreading through lymph nodes and lymph vessels to other parts of the body. Lymphoma cells containing cancer are shown inside one lymph node. Another inset shows cancer cells in the bone marrow.